Barefooters will sometimes be told by store employees that they have to wear shoes because “OSHA requires it.” OSHA is the Occupational Safety and Health Administration, and it only applies to employees, not customers. And even then, there is no specific rule that says that even store employees need to wear shoes (though of course the business itself might require them). The part of OSHA regulations that apply to footwear is 29 CFR 1910, subpart I, “Personal Protective Equipment”. The first part that is relevant is 29 CFR 1910.132, which is known as the General Duty Clause. This says that the employer has a general duty to do a hazard assessment and take proper precautions. working in areas where there is a danger of foot injuries due to falling or rolling objects, or objects piercing the sole, and where such employee’s feet are exposed to electrical hazards. It then goes on to list the standards for such protective footwear, and regular shoes do not meet that standard. That means that if standard shoes are acceptable (such as in a store or restaurant), then this section simply does not apply. Let me also add that I have never seen a Health Code (and I’ve seen a lot) that requires footwear for the employees of restaurants. The requirements on clothing are only that the clothing be neat and clean, not what clothing had to be worn (with the exception of gloves for handling food directly, and something to keep hair from getting into food). 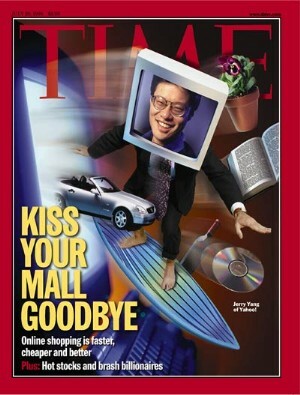 Jerry Yang was even depicted barefoot on the cover of Time Magazine (July 20, 1998). If course, OSHA being OSHA, they could never come out and say that was OK.
Here’s my exchange of letters. I would like an interpretation of OSHA regulations. Is there anything in OSHA regulations or the interpretation of OSHA regulations that requires the wearing of any footwear at all in a business location that does software development? In other words, is there any regulation prohibiting an employee from being barefoot at his or her desk, or while walking in the halls? Such a location is a typical office-type, computer environment, carpeted or tiled, without hazard of dropped heavy objects, or hazard of nails or large staples. I guess the reply ought not surprise anybody. Did you know that the standard office is just teeming with imagined hazards? This is in response to your letter requesting an interpretation on the use protective footwear at a software development company. OSHA general personal protective equipment standard, 29 CFR 1910.132 requires each employer to conduct a hazard assessment of their worksite to decide what personal protective equipment is necessary to protect employees. The hazard assessment must be site specific and only someone familiar with your work situation can decide what foot protection is necessary. It is unlikely that going barefoot would be appropriate while walking the halls even in an office setting. Often things like staples, mail carts, and deliveries of boxes of photocopying paper can expose the feet to hazards. Also, employers have the right to make their rules stricter than OSHA standards. Thank you for your interest in safety and health. I thought it might be worth trying to pin them down a bit more. Had they really thought this through? Would those hazards he pointed out also apply to the sorts of shoes people regularly wore? I am terribly sorry to continue to bother you with this issue. I am writing in regard to your reply. I am afraid that I am confused by your answer regarding OSHA regulations applied to barefoot employees at a software development company. After saying that, under 29 CFR 1910.132, a worksite-specific hazard assessment must be made, you then state that bare feet would be inappropriate due to a number of hypothetical hazards, including the possibility of staples on the floor. If the site survey found no evidence of staples on the floor, would footwear still be required by 29 CFR 1910.132, or is it necessary to imagine any possible hazard that might be present to do a proper survey? Your reply then went on to state that bare feet in a typical office environment would be exposed to hazards from such things as deliveries of boxes of photocopying paper. Since the thin cloth uppers of sneakers provide no protection against a falling box of paper, does this mean that a stronger level of protection, such as that mandated by 29 CFR 1910.136, must be required by the software company? Naturally, employers have the right to make their rules stricter than OSHA standards, but it is not clear from your reply whether the OSHA standards themselves require footwear in a typical software development environment. Could you please clear this up. Thank you for your further attention to this matter. Now the reply did a nice job of clarifying just what that hazard assessment entailed. But he just couldn’t let it go at that. There must be something wrong with bare feet, right? OSHA general personal protective equipment standard, 29 CFR 1910.132 is a performance based standard. It is the employer’s responsibility to assess the hazards in the workplace and determine what personal protective equipment is required. If no hazards are present, then OSHA requires no personal protective equipment such as the wearing of shoes. Stating what equipment is needed can only be done accurately by someone who has actually visted the worksite. Each unique situation must be evaluated. It is necessary not only to look at the hazards currently present but also at the potential hazards. The thin material of sneakers is some protection against falling objects. If boxes or even scissors are dropped from very short heights, it is possible that sneakers would be adequate protection. If these materials could be dropped from a couple of feet or more or thrown with some force, then greater protection may be needed. It is up to the employer to determine what personal protective equipment is necessary for the hazards at the worksite. So there you have it. Sneakers, in this guy’s view, are also suspect. Everything is suspect. I guess we shouldn’t be surprised. That is his job after all. But in reality, I think we need to look at the meat of the letters. If regular shoes are okay, bare feet almost assuredly are, too (at least if you do a logical analysis). The other thing is, we never heard of OSHA going after Yahoo (or a zillion other software companies during that period) for having barefoot and comfortable employees. That says more than any letter. You’d think this would be enough to prove to my college that barefoot is 0k. You would be wrong. Not even showing a guy jumping on broken glass would do it. 0r statistics showing that a large proportion of all trips and falls can be directly blamed on shoes. Sigh.